Recipe adapted from Vegan Yumminess. [Recipe makes 6 servings]. It's official; The Mint Bunny has its first recipe post! We decided to go with macaroni and cheese today because it's become a go-to dish at our place. It's easy to throw together, vegetable-based and full of flavor, and reheats beautifully; win-win-win! 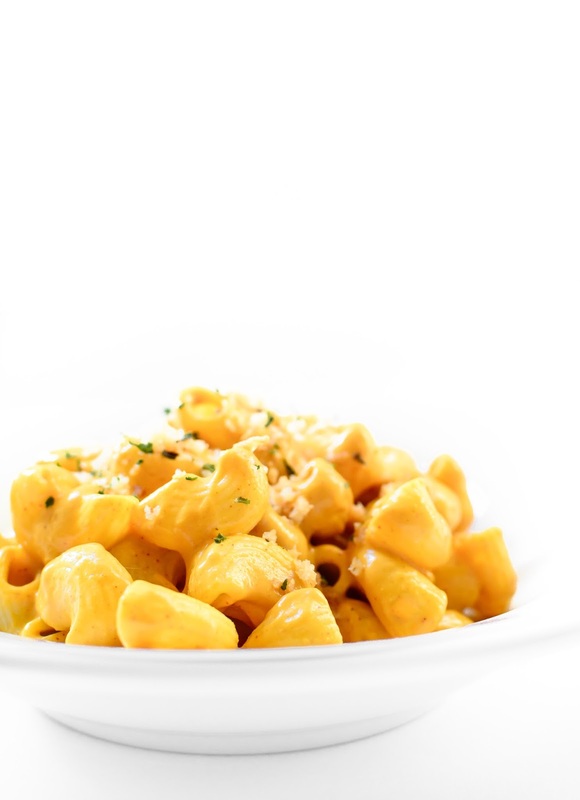 For someone who has never tried vegan macaroni and cheese before but is ready to cut out dairy, we'll echo what other vegans say. And that's that cheese sauces made with nutritional yeast will not taste identical to dairy-based cheese sauces. They'll be just as 'creamy', have a similar profile, and have a similar appearance. But sauces made with nutritional yeast will always taste different. And you know what? This is totally okay because it's equally as delicious (not to mention so much healthier)! If this is your first time making a dish like this, let us know your thoughts. Similarly, if you're a vegan macaroni and cheese expert, what defines the perfect macaroni and cheese in your opinion? Cover the vegetables and bay leaves with cold water in a sauce pan, and bring to a boil. Reduce to a simmer and cook for 20 minutes, or until all of the vegetables are soft. Discard the bay leaves and drain the vegetables, making sure to save one cup of the liquid for the sauce. While you're making the sauce, cook the pasta, drain, and reserve. For the sauce, add the cooked vegetables, cashews, almond milk, reserved vegetable water, lemon juice, Dijon mustard, nutritional yeast, salt, garlic powder, paprika, crushed red pepper, and turmeric to a high-speed blender. Blend until extremely smooth. For the breadcrumbs, heat the truffle oil in a sauté pan. Add the panko, and sauté until lightly browned. Transfer to a separate container once browned, to prevent the panko from burning. If you wish to serve everything in one sitting, combine all of the sauce with all of the pasta, and serve. Top individual servings with toasted panko. [Side note: We love to add roasted broccoli or cauliflower to our bowls. Feel free to add your favorite vegetables to the dish for some bonus nutritional points and added texture]. If you plan having leftovers, we recommend keeping the three components of the dish separate. To reheat individual servings, mix desired amount of pasta with desired amount of sauce in a microwavable bowl and heat in 30 second increments until heated through. Top with panko and enjoy.